On my first full day back in Birmingham, I picked up my friend and former bandmate Brent Stauffer at the pizza place where he works and had a little lunch. Okay, in fact, it was a very BIG lunch–a calzone as large as my head. I had heard that a place called Green Cup Books was the place to go for independent authors like myself. So Brent and I headed over there, hoping to get a couple of books on the shelf and maybe arrange a last-minute reading while I’m in town. But alas, we found that the place was OUT OF BUSINESS. And recently too because there were still shelves full of books inside. As long as we were in town, I stopped at Jim Reed Books, which is really more of an antiques and novelty museum than a book store. 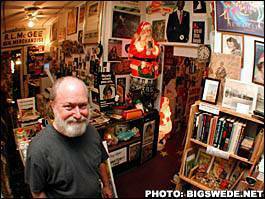 If you’ve never been to Jim Reed Books and you live in the Birmingham area, GO NOW. I don’t believe there is another place like it in the world. Jim was kind enough to take a couple of copies of my book on consignment, so somebody please go and buy them. Both copies are signed! On a side note, I should mention that Jim’s brother is the Reverend Fred Lane, one of the most entertainingly insane musicians you will ever go far out of your way to hear. After that, I dropped Brent off at his house and went to visit another old bandmate, Tym Cornell. Tym is running a fantastic music studio out of his basement in Roebuck these days, so if you are a musician in Birmingham and need a cheap place to make an album, Tym is your man. He is also quite good with video production. Tym’s wife Mary made some excellent pasta for dinner, and then I headed downstairs to the studio to listen to some of Tym’s most recent work. One of his current projects is to record an album for our mutual friend George Mostoller, whom I mentioned in a previous post. Somehow, Tym has arranged for some first-class musicians to play on this recording, including bassist extraordinaire Oteil Burbidge. I have never heard George’s music sound so good. This entry was posted in Birmingham and tagged Birmingham, books, literature, music, road trip on December 12, 2009 by mdavidhornbuckle.